Brad Stone's new book, The Everything Store, describes how Bezos developed this strategy after reading another book called The Innovator's Dilemma by Harvard professor Clayton Christensen. As for a business book. 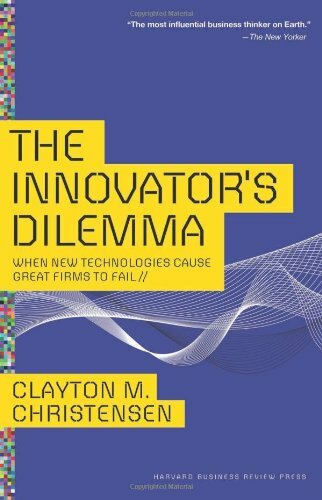 I will probably go with Clayton’s Christiansen’s “Innovator’s Dilemma”. Clayton’s book not only defined “disruption” (a word that is still abused by journalists to this date) but it introduced me to strategic thinking. When I read the book I probably missed a lot of the nuances around corporate politics, as I barely had any work (or life) experiences. But I keep re-reading it from time to time and always find new insights. Probably one such a moment [when something I read in a book helped me] was about 20 years ago when I discovered Clayton Christensen, first via his academic papers and then after he started writing his books. Innovator’s Dilemma was his first and an a-ha moment for me at that time, as I started to perceive the value of creation process in a company in a different way than I thought it was like and which ultimately made me quit my corporate career and become an entrepreneur. The Innovator's Dilemma, by Clayton Christensen. An analysis of why great companies fail, because innovation often requires throwing out everything that has made you successful in the past. Disruptive technologies are often born on the fringes, in markets where worse is better. Then you have the classic business books like The Innovator's Dilemma. Then you're getting into more the large business kind of thinking. The Innovator's Dilemma by Clayton Christensen in order to understand what disruptive innovation really means. "The Innovators Dilemma" by Clayton M. Christensen, especially for those having a deep organisational (big company) experience before making the switch to entrepreneurship. The above two to learn to take advantage of opportunities and constantly balance between growth + guaranteed success. Frequently books will trigger moments of clarity for me as a leader. There are always problems that I am working/thinking through and books can frequently provide a new lens that leads to a solution. Recently Clayton Christensen’s book The Innovator's Dilemma did this for me. It was my second time reading the book but it sparked a weekend’s worth of writing and processing that led to actionable changes the following week. I can’t remember specifically what I read that initiated it all, but the results are undeniable. This is an important read, even if you’re at the very early stages of growing a startup. The bestselling classic on disruptive innovation, by renowned author Clayton M. Christensen. His work is cited by the world’s best-known thought leaders, from Steve Jobs to Malcolm Gladwell. In this classic bestseller—one of the most influential business books of all time—innovation expert Clayton Christensen shows how even the most outstanding companies can do everything right—yet still lose market leadership. Christensen explains why most companies miss out on new waves of innovation. No matter the industry, he says, a successful company with established products will get pushed aside unless managers know how and when to abandon traditional business practices. Offering both successes and failures from leading companies as a guide, The Innovator’s Dilemma gives you a set of rules for capitalizing on the phenomenon of disruptive innovation. Sharp, cogent, and provocative—and consistently noted as one of the most valuable business ideas of all time—The Innovator’s Dilemma is the book no manager, leader, or entrepreneur should be without.